Preliminary numbers for this school year show that charter, private and home schools added more students over the past two years than the Wake school system did. Though the school system has added 3,880 students over the past two years, the growth has been 1,000 students fewer than projected for each of those years. This growth at alternatives to traditional public schools has accelerated in the past few years since the General Assembly lifted a cap on the number of charter schools and provided vouchers under the Opportunity Scholarship program for families to attend private schools. New Wake County school board Chairman Tom Benton said the district needs to be innovative to remain competitive in recruiting and keeping families in North Carolina’s largest school system. At a time when people like choice, he said Wake must provide options to families. Wake County is not unique in this regard. 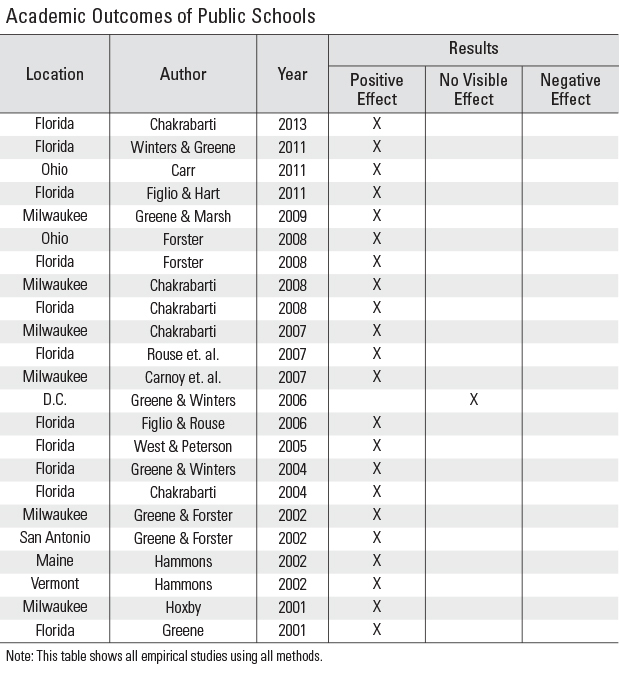 As readers of this blog surely know (and as I’ve written elsewhere), there have been 23 empirical studies investigating the impact of school choice laws on the students at district schools. As shown in the chart below, 22 of those studies found that the performance of students at district schools improved after a school choice law was enacted. One study found no statistically significant difference and none found any harm. Beating district schools over the head with more and more top-down regulations has done little to improve quality. A better approach is bottom-up: empower parents with alternatives and give district schools the freedom to figure out how to provide a quality education that will persuade parents to choose them. This entry was posted on Wednesday, December 9th, 2015 at 11:00 am and is filed under charter schools, competitive effects, tax-credit scholarships, Uncategorized, vouchers. You can follow any responses to this entry through the RSS 2.0 feed. You can leave a response, or trackback from your own site.